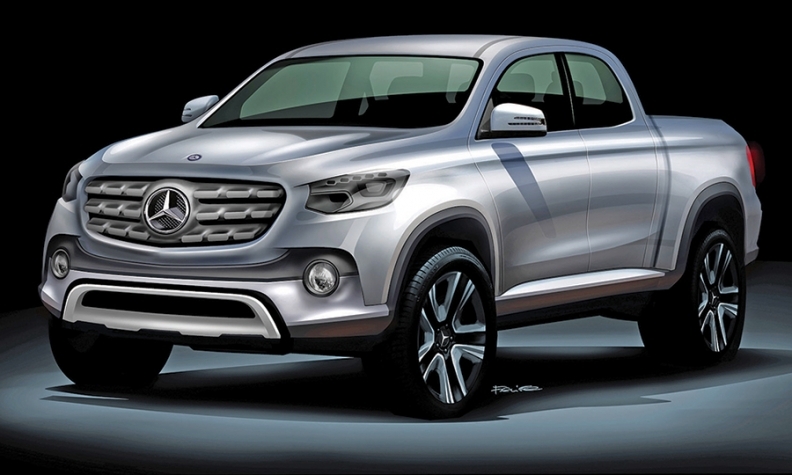 Mercedes-Benz released this sketch of the pickup it plans to launch by 2020. FRANKFURT -- Daimler declined to comment on a report that its first Mercedes-Benz pickup will be based on the Nissan Navara. Nissan would build the Daimler-designed pickup based on Navara architecture with Daimler providing technology including four- and six-cylinder powertrains, the Wall Street Journal reported, quoting two people familiar with the situation. "As a rule, we do not comment on any speculation about our future projects," a Daimler spokeswoman told Automotive News Europe. On Friday, Daimler announced plans to launch a midsize pickup truck before 2020 targeted at the European, Latin American, Australian and South African markets. The pickup will be developed and designed by the Mercedes-Benz Vans division, the company said. Daimler said no decision has been made about whether to launch the vehicle in the U.S.
Daimler has an industrial partnership with the Renault-Nissan alliance that includes cooperation on engines, joint development of the Smart ForTwo and Renault Twingo minicars and for Nissan to supply Daimler's Japanese commercial vehicles unit, Mitsubishi Fuso Truck and Bus Corp., with Nissan's NV350 transporter van.